Delhi exists in a kind of quantum state: In Delhi, all things are true at once. When the Big Apple no longer felt big enough, Dave and Jenny moved to a city of 16 million people and, seemingly, twice that many horns honking at once. 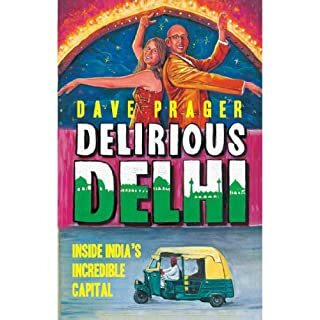 Delirious Delhi depicts India's capital as the two experienced it, from office life in the rising tech hubs to the traffic jam philosophy that keeps people sane in the gridlock leading to them. With only their sense of humour as their guide, Dave and Jenny set out to explore a city in which ancient stone monuments compete with glass-clad shopping malls to define the landscape. 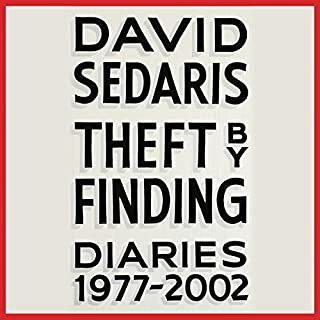 Since discovering 'Theft By Finding', I've been binge listening to every David Sedaris audiobook I can get my hands on. I loved his adventures in Japan in 'Engulfed in Flames' and his crazy, chalk-throwing French teacher in 'Theft By Finding' -- a book I listened to 3 times in a row, back to back. So, it's not easy picking a favorite, but I have to say 'Calypso' is a masterpiece. It's one outstanding -- and often hilarious -- essay after another, like that rare album where every song is a smash hit, from beginning to end. 'Calypso' mostly focuses on his contemporary experiences. While there are some serious and sombre moments, which we can all relate to, there are still a lot of far out, laugh-out-loud moments. I enjoyed this book so much that I'm going to have a hard time waiting for his next book, which I hope and pray is the follow up diary entries to 'Theft By Finding' volume one. 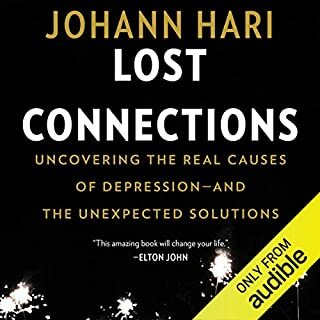 I just finished listening to Lost Connections and feel compelled to write a review because I want this information to be in the hands of as many people as possible. I'm even going to purchase paperback copies to give out to friends and relatives and anyone else I come across who could benefit. This is easily the most profound book I've ever come across, and not because the ideas presented were new to me (doctors questioning the safety and effectiveness of SSRIs, culture and societal causes, the benefits of mindfulness, etc.). I'm familiar with these topics and have read books on each subject. But never before has someone presented these ideas to me in a cohesive manner and in this context, so I could never do anything with the information. Now, it's like a light suddenly came on. It all finally makes sense. The author clearly explained the reasons I've been dealing with anxiety my entire life and now I finally have a way out and a new direction. As for the reviews criticizing the author for discussing politics and social policy, I can only hope, for their sake, they will rethink their position on this. I understand people have firmly held beliefs and that it can be painful when life-long concepts and ideas are challenged. However, I cannot see how one could discuss mental health without addressing the very political and social issues that affect all of our lives. So what makes this different from every other "self help" book out there? One word: "reality". Most books discuss solutions as if the reader has unlimited time on his/her hands and doesn't have to live in the real world (i.e. working long hours at a job they hate etc.) Johann never loses focus on this. He approaches each idea/solution with a healthy skepticism and never dodges or avoids asking the tough questions. Again, I can't recommend this book enough. I think anyone could benefit from reading this, especially if they or someone they know has dealt with mental illness. But even if you've never personally dealt with these problems, you're still subjected to the same pressure and junk values promoted through advertising, politics and Western culture. This is a tough book to write a review for since it's unlike any other book I've ever read (or listened to). The "random" journal entry style is unconventional and surely won't be everyone's cup of tea. However, there is a story here if you're patient enough to stick with it. (The book starts a bit slow but I assure you it's worth it. The second half when he's in France is priceless!) I rarely laugh out loud, but the absurdity of the situations he encounters and his observations about them are priceless. 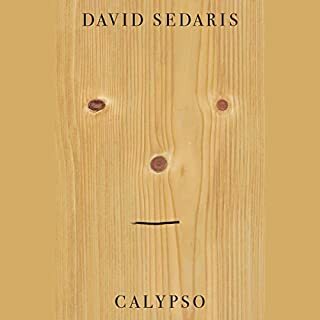 Simply put, David Sedaris is a genius. I REALLY hope there's going to be a sequel (i.e. years 2003-2018). Overall, I'd rate this as one of the best and most memorable audible books among my large collection. Horrible. THE worst self-help book I've ever read. What disappointed you about Stop Saying You're Fine? If you want a book where the author makes sweeping judgements about your life and then goes on to berate [you the reader] in between irrelevant hypothetical stories, then look no further. It's littered with accusations and statements like 'YOU are the problem! ', 'YOU, and YOUR DUMB*** excuses', and you're 'acting like a chicken or a jerk.' Seriously, I couldn't make this stuff up. It's like a bad parody of the self-help genre, only it's not. Sorry Audible, but this isn't even worth the Daily Deal price I paid. Has Stop Saying You're Fine turned you off from other books in this genre? No, but this is the most condescending and depressing self-help book I've read. Her point about our tendency to self-sabotage or limit ourselves isn't necessarily wrong. The problem is how she delivers the message. The repeated accusations and long drawn-out stories are both unprofessional and shows she lacks the material to produce a serious self-help book. In fact, you could close your eyes and pick ANY self-help book off the shelf and do better. A different book by a different author with a different narrator perhaps? If you could play editor, what scene or scenes would you have cut from Stop Saying You're Fine? This book is very repetitive. After an hour of listening, she was still hammering home the same point she was making in the first five minutes. I got it. I'm a lazy jerk or a chicken. I'm amazed they actually published a book like this in the first place! I'm not sure why someone would willingly sit through hours of this condescending audiobook. I have more respect for myself and my time than to waste it being scolded and talked down to by someone who measures success in life by shallow and conventional means. 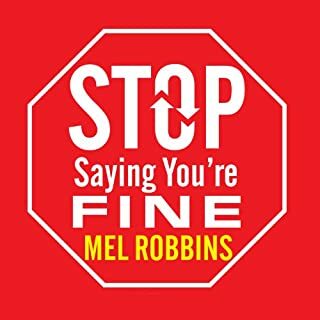 There are better, helpful books out there, like 'The Confidence Gap', 'Your Erroneous Zones', 'Pulling Your Own Strings', or 'Rejection Proof', to name a few. What made the experience of listening to Disrupted the most enjoyable? 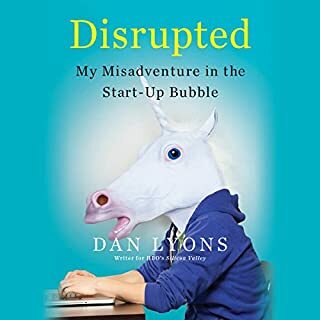 If you like HBO's Silicon Valley and The Disaster Artist, then I think you'll love Disrupted. 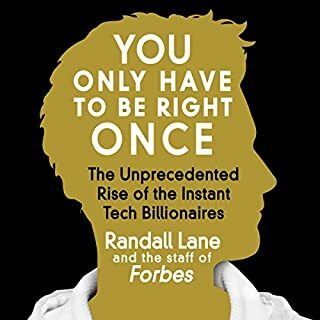 I've been working in the tech industry for 20 years as a software developer and entrepreneur, and this book nails it -- the hubris, the overvaluations, the cult-like "team player" mentality. I like how the author made every mistake imaginable, like showing too much initiative. Without meaning to, he essentially became the Swingline stapler guy from Office Space. What was one of the most memorable moments of Disrupted? I don't want to give away too much of the book, but I loved the outcome when Dan showed initiative and went to the owners with his passion project. If you've ever tried this or you've at least read "Stealing the Corner Office" by Brendan Reid, then you know how dangerous this can be for your career. In Dan's case, it was a train wreck of hilarious proportions. What about Dan Lyons’s performance did you like? Not only can this guy write, but he's also a great narrator. Usually authors are terrible at narrating their own material, but Dan seems to have a knack for comedy. His timing, inflections, and impressions are all great. He reminded me of toned-down Adam Carolla. I laughed a lot. I found myself relating to Dan throughout the book. I've often encountered the types of personalities and situations he describes in my own career and business experiences. Suffice to say, I've met a few Marketing Mary's in my time. I really enjoyed The Disaster Artist when I listened to it a few years ago. I've been searching for something similar to fill the void ever since. This is that book! I'm also a huge fan of HBO's Silicon Valley, which is like the TV version of Disrupted, so this was a perfect choice. I read a few reviews that criticized the author for making fun of the industry, as if he was being mean or something. Sorry, but I'm going to be perfectly blunt here. The industry is a joke, and it's ripe for criticism. Anyone who isn't starry-eyed and enamored by the hype would realize virtually all of these companies are grossly overvalued thanks to foolish, greedy, and overzealous investors. If you're a developer, then you know there's a new latest and greatest language, framework, or library released every week, and you can't go to a business meetup event without running into half a dozen twenty-something marketing "gurus" who have no formal business or technology education whatsoever. I'm not saying this is necessarily a bad thing. There are still a tremendous amount of opportunities, even if most of the people who become internet billionaires come from privileged and well-connected backgrounds. But there's no shortage of nerdy Wolf of Wall Street types who drink their own Kool-Aid (and bring teddy bears to meetings). I'm actually surprised there aren't more expose books like this out there! Over the last three years, Forbes has published in depth profiles of this new batch of billionaires, including the founders of Spotify, Dropbox, Tumblr, and Twitter. Now, in a compilation introduced and updated by Forbes editor Randall Lane, fans and critics alike will get a comprehensive look at who these super-entrepreneurs are and what they say about their own success and their plans for the future. This might inspire someone to keep plugging away at their software project or other entrepreneurial project. It's not a total waste of time, but you won't learn much either. Almost all the people featured were already privileged and well connected before they made their millions or billions. At worst, they were destined for an upper middle class or lower-rich life in any case. Example: When one of these young men was lacking initiative, his mother called up the CEO of a major TV network, who she was friends with, and got her son an internship. How many of us have those kinds of connections? Has You Only Have to Be Right Once turned you off from other books in this genre? Generally speaking, yes. I like biographies, but there was very little depth here. Most business books are hype or fluff. This is really just a feel-good overview of an industry that can rarely justify the valuations of these ventures. Is Instagram really worth more than companies that have been around for half a century? Which character – as performed by Walter Dixon – was your favorite? "Character" doesn't really apply to a biography, but the kid who turned down Facebook's offer is probably the biggest putz I've ever heard of! Otherwise, the narrator did an adequate job... I have no complaints. It's not worth the price to purchase, but some young person (i.e., early 20s) in the tech sector might find it motivating. I'm in the tech sector, but I'm in my mid 30s, and I've been involved in business for too long to buy into the hype that riches are just around the corner for anyone with a good idea. While the book doesn't explicitly make that claim, I think that's what most people are going to take from it. Honest business books are rare, especially if they have enough useful content to justify 200+ pages. Having read countless business books, I've only found two or three to be genuinely useful. You might want to skip this and get a copy of "How to get rich" by Felix Dennis (founder of Maxim Magazine). Don't let the title scare you. If you really want to know what it takes, this is the most sincere book you'll ever find on the subject. Another book that is really good is Norm Brodsky's "Street Smarts". This might appeal to someone who already has some understanding of the game. I knew learning something visual from an audio book was going to be challenging, but amazingly that wasn't the problem. The problem was the author and I disagree on what the term "beginner" means and what exactly a beginner needs to know in order to follow along. Whatever it is, I'll be weary of audio books like this one. I think I'll pick up a physical copy of "Football for Dummies." I haven't been disappointed with those guides yet. Their books on hockey and golf were excellent and very detailed. Disappointment and frustration definitely describe my feelings with this book. You might something titled "Football 101" would be geared towards people with little or no knowledge of Football. Well, not according to this author. Instead of defining terms, explaining the field and equipment, and discussing what each player's role is (and how many players are on each team), the book goes straight into discussing plays. Don't know what all the terms mean? Too bad, you should have picked those up somewhere else! Ironically, the author mentions in the intro that he learned Football by reading books. 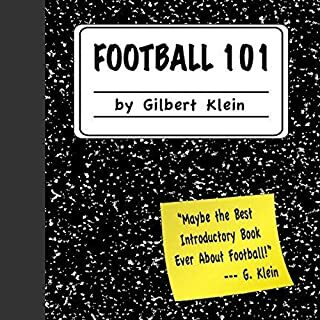 "Football 101" would have been more useful if he'd just named those books for the listener and said "the end." If you have the paper edition of "Football 101," then congratulations, you've got yourself a handy doorstop. What did you love best about The Disaster Artist? Everything. I'd never heard of The Room, but Audible had this book as their daily deal, so I took a chance on it. Greg and Tommy's story are both hilarious and fascinating. It's hard to believe they actually made a movie. Having now seen The Room, which is awesome for all the wrong reasons, this behind-the-scenes look makes it that much better. 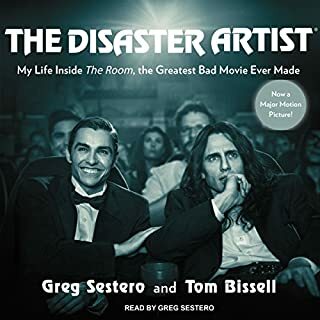 What other book might you compare The Disaster Artist to and why? Which character – as performed by Greg Sestero – was your favorite? Tommy Wiseau. Greg's impressions of him are so good that you simply must listen to the audiobook version. Yes, yes, oh yes. I found this accidental find more entertaining than anything I've purchased in the last several years. I just wish there was a sequel -- another movie or a book by Tommy. Greg did a fantastic job narrating the book, and you can really sympathize with him.